The Scottish Living Wage is the real living wage – the UK government just hijacked the brand! The new rate of £8.45 is a welcome increase for many thousands of low paid workers. Also congratulations to public sector ferry operators Calmac, for their Scottish Living Wage Champions award. The start of Living Wage Week is an opportunity to remind everyone that the real living wage is based on actual costs of living. While any increase in the national minimum wage is welcome, it remains a flawed approach - not least because the 'living wage' element only applies to the over 25's. Shops don't differentiate pricing for those under that age. I was chairing a session at today's Living Wage Expo that highlighted the difference between the two approaches with experts from the Resolution Foundation and the Centre for Research in Social Policy. The ‘real’ Living Wage movement requires strong advocates who can offer clear differentiation against rates that are not based on cost-of-living. While there is a welcome cross party consensus on the real living wage, there is a more positive approach in Scotland. “For business, paying the Living Wage makes sense - it’s an investment in people and all the evidence shows it leads to increased productivity and reduced staff absence and turnover, while sending a strong signal to customers about fairness. Yet we also know around 20 per cent of Scotland’s workforce earn less than the Living Wage. With low pay one of the main drivers of in-work poverty, it’s vital that employers who can pay the real Living Wage do so." The Scottish Government has made an important commitment to pay the living wage for adult care workers, even if the implementation has been partial and muddled. They should make a similar commitment for childcare workers, 80% of whom are paid below that level. The proposed voucher scheme won't deliver a well-trained and fairly paid workforce. Both of these sectors rely heavily on government funding and therefore government has the levers to make real progress on the living wage. “The fight for decent pay won’t be won just by employer goodwill, however. We need strong unions who can negotiate with employers and win fair pay for their members, along with a rise in the government’s minimum wage." Wages are also not the whole story. Bad employers cut other terms and conditions, like holidays and sick pay, to meet the statutory minimum wage. That's why the broader fair work approach in Scotland is so important. Again, the Scottish Government has taken a positive approach through the Fair Work Convention and the Labour Market Strategy. The challenge is to use the levers of government to deliver on the worthy ambition in these approaches. Living Wage Week is an opportunity to promote the Scottish Living Wage. Today's conference heard some inspiring stories from workers and employers on the benefits for individuals and businesses. Scotland has made good progress, but there is much more to be done. A good example of this is drug costs. Spending increased by over 10% between 2012/13 and 2014/15 and it is predicted to rise further by 5 to 10% each year. 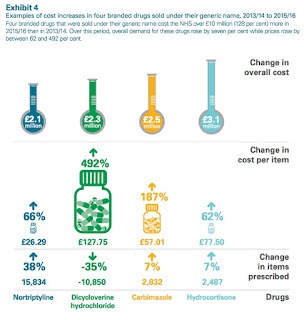 This very scary graphic from the report illustrates the point well. NHS boards continue to find it difficult to meet key national performance targets. 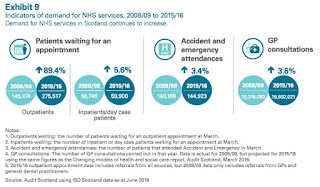 Overall NHS Scotland failed to meet seven out of eight key targets. The only standard met nationally was the drug and alcohol treatment standard, although it was close to meeting the cancer target. This is reflected in the increasing demands on the NHS, as this infographic shows. The Scottish Government has missed the statutory target to eradicate fuel poverty this year by some distance. So, new reports on fuel poverty should be welcomed, but only if they are quickly followed by a new strategy. According to the latest statistics (2014), there are 35% or around 845,000 households living in fuel poverty in Scotland, and 9.5% (229,000 households) living in extreme fuel poverty. This high rate of fuel poverty is largely unchanged since 2009, and has doubled since the Scottish Government‟s fuel poverty target was set in 2002. The Scottish Fuel Poverty Strategic Working Group and Scottish Rural Fuel Poverty Task Force reports have been published alongside a Scottish Government research paper on the likelihood of being fuel poor in rural Scotland. This is to help identify and target households in rural Scotland who have a high risk of being in fuel poverty. “Everyone should be able to heat their home and keep themselves and their families warm, therefore tackling and eradicating fuel poverty is vital and we must make sure action we are taking is making a difference to those that need it most." It would be hard to disagree with the recommendations in these reports, although it is strange that the Scottish Government chose to highlight a review of the definition of fuel poverty in their press release. The definition probably does need reviewing, but leading with that gives the impression that the problem can be wished away with a new definition. The acid test of today's announcement will be if Scottish ministers use these reports to set out a new fuel poverty strategy, which includes a new target date to eradicate fuel poverty in Scotland. Health & Safety Week - challenging authority. ‘Those in authority must always be challenged’. According to BBC presenter, John Humphries, that was the key lesson to be learned from the Aberfan disaster. Miners repeatedly warned the employers that the rock and shale tip was unsafe prior to the disaster that killed 116 children and 28 adults on 21 October 1966. This could also be a motto for health and safety representatives as we start European Health and Safety Week. Up and down the country, union health and safety reps and union branches will use the week to highlight the vital importance of effective safety law. It is particularly important this year given the threat of Brexit. A ‘Hard Brexit’ means the UK would have more freedom to opt out of EU regulation and reinvent its regulatory framework. That could mean continuing in the deregulatory direction of travel first set by the coalition government in 2010, including the 2014 report for the DWP that drew up targets for repeal. Even under softer Brexit options, the UK will lose its influence over European safety standards. On Friday, I was launching UNISON Scotland’s annual survey of violence at work. It shows a rise of 20,000 to 40,000 violent assaults per year in the last decade (2006 to 2016), against public service workers in Scotland. With a significant increase in violent assaults against local authority workers – up by 4399, from 13,206 to 17,605. And these are only recorded incidents – the tip of the iceberg. All workers who deal with the public are at risk, but care workers are at twice the national average risk of assault. A majority of these workers are now employed in the private and voluntary sector. Although most members surveyed said their employer encouraged the reporting of violent incidents, worryingly 83% said that their employer regarded the violence as ‘part of the job’. This doesn’t surprise me, as I have heard the CEO of a majority care charity say just that. Leadership is important in safety and CEO’s, far removed from the reality of front line care, should know better. This year, the theme for Health and Safety Week is “healthy workplaces for all ages – promoting a sustainable working life”. This is an opportunity to reflect on the opportunities and challenges an older workforce brings to the workplace. This is particularly true in the Scottish public sector workforce, where because of austerity; the fastest growing part of the workforce in proportional terms is 50-59 year olds. One aspect of this was covered at a recent STUC conference on workplace dementia. More than 40,000 people under the age of 65 have been diagnosed with dementia in the UK, 3,200 of those in Scotland. It is estimated that 18% of them continue to work after a diagnosis and therefore this is a growing workplace issue that employers and unions should be addressing. UNISON has also published two new health and safety guides for members in preparation for this week: Resilience and Well-Being and Behavioural Safety. ‘Resilience’ is the new buzz word in health and safety. Some employers are trying to change the way we look at health and safety. They want the focus to shift away from what managers should be doing to manage health and safety in the workplace, towards finding reasons to blame employees when something goes wrong. I bet the charity I mentioned above thinks that is a great idea! So, let’s use European Health and Safety Week to celebrate the great work our safety representatives do every day to help keep us safe. Welcome the sensible framework of safety law that has been developed in partnership with our colleagues in Europe. And most importantly, commit to keep challenging those in authority. Important though actions to ameliorate poverty are in the short-term, it is through preventative spending and early interventions that we will begin to eradicate poverty in Scotland. One of the most important of these interventions is through early year’s provision. This is Challenge Poverty Week in Scotland in which the Poverty Alliance and its member organisations seek to highlight the reality of life for over 900,000 people living in poverty. It is therefore a good time to look at the measures being taken to address poverty. The Scottish government has chosen this week to publish its blueprint for the expansion of early years learning and childcare (ELC) in Scotland. The centrepiece of this plan is to almost double entitlement to free ELC to 1140 hours per year by 2020 for all three and four year olds and eligible two year olds. With this statement you would assume that the plan would be to expand high quality early year’s provision that makes a real intervention in the lives of children at this crucial period in their lives. The blueprint also reminds us that we are a considerable way from achieving this in the private sector, with 80% of practitioners and 50% of supervisors in partner provider settings paid less than the Scottish Living Wage. Levels of qualifications are also poor in this sector. To deliver the laudable aims in the blueprint we need a delivery mechanism to match. This is sadly where the plan starts to unravel. Three of the four options in the blueprint are demand led approaches, very similar to the Tory voucher scheme approach to public service delivery. The obvious risk in this approach is that it leads to a race to the bottom in quality provision and the wholesale privatisation of the sector. This is not entirely unexpected. The SNP manifesto commitment to employ an additional 20,000 childcare workers and build 200 early years centres, always looked optimistic on a suspiciously round budget of £500m. Sadly, government budgets don’t stretch on the loaves and fishes principle! We have some experience of a race to the bottom in the social care sector. Because of budgetary pressures, social care has suffered from a race to the bottom in poor quality care. The consequences are half a million patient days in hospitals lost to delayed discharges. Only now are we beginning the climb up from the bottom with the requirement to pay the Scottish Living Wage. Even so, most councils in Scotland are still a long way from a quality care standard as set out in UNISON’s Ethical Care Charter. The workforce lesson is that this approach results in workers that feel so undervalued that they don’t want to work in the sector and turnover rates soar. When you add Brexit to the mix, recruiting 20,000 additional workers to the sector is going to be beyond challenging. So, my plea would be to learn the lessons of social care and don’t replicate them in ELC. We need a fairly paid, well trained workforce that can make the early year’s interventions that can close attainment and inequality gaps. We know all too well that privatisation and inequality go hand in hand. Fair work and employee voice are key elements of an economic strategy for Scotland. There is even a welcome cross party consensus developing. I was giving evidence to the Scottish Parliament's Economy Committee today on the issue of fair work and employee voice. UNISON welcomes the Scottish Government’s recognition, through the Fair Work Convention and Labour Market Strategy, that a more progressive relationship between employers and their representatives can increase productivity and growth in a way that is inclusive and fair. The principle is becoming almost a cross party consensus, given Theresa May's recent rhetoric and establishing an inquiry led by Matthew Taylor. Even George Osborne recognised that subsidising low wage employers made no sense, hence his 'living wage'. Botched implementation, but the principle was right. Labour's 2020 Workplace Initiative has the potential to be even more radical. Poor work drives negative outcomes way beyond the labour market. Insecure work, long hours and low pay impacts on families and communities and is a key driver of inequality. More than half of households in poverty in Scotland are in work. We know from international evidence that unequal societies do worse on every measure. At today's session I suggested three stages to help deliver fair work. As a first stage we should identify poor employment practice. That means naming, shaming and prosecuting employers who don’t meet the legal minimum standards such as the National Minimum Wage. It also means speaking out against poor employment practice such as exploitative zero/notional hour contracts. The second stage is to promote good employment practice. 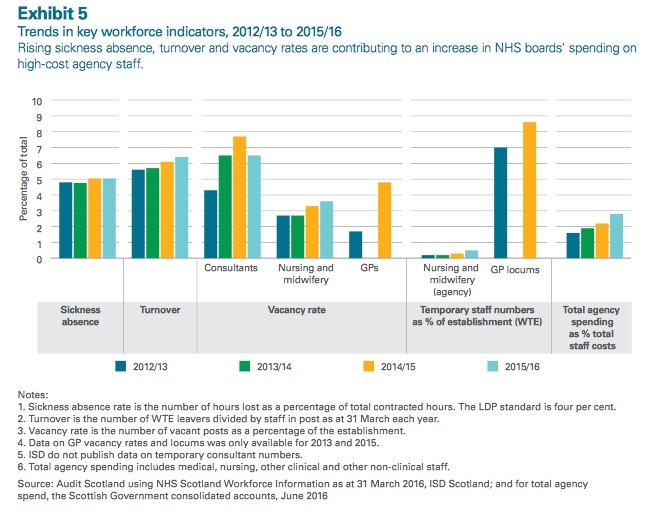 I would point to NHS Scotland’s PIN policies and staff governance framework as a model approach. These go beyond collective agreements and offer practical guidance on a wide range of issues. The Scottish Living Wage is an obvious example of positive employment practice and good progress has been made in extending accreditation in Scotland. Particularly in the hard to reach SME sector. While the Business Pledge is not unhelpful, we should be wary of ‘badges’ that don’t come with rigorous accreditation and monitoring. Good employment practice should also recognise the needs of all workers. Everyone is entitled to be treated with dignity and respect. The ability to work without prejudice is a fundamental right, regardless of your background, gender, colour, disability or sexual orientation. Everyone should also be able to work without suffering harm. Each year in the UK, up to 50,000 people are killed by work and around two million people are either made ill or more ill because of their work. Public procurement. The new statutory guidance on workforce matters is an important step forward, but it needs to be properly implemented. Sectoral Bargaining. There is a strong relationship between collective bargaining coverage and low wage work. The Scottish Government could promote sectoral collective bargaining in areas where it has the most leverage, including social care and childcare. These are sectors with many poor working practices. 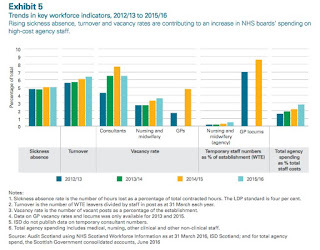 For example the recent 'Early Start' report identifies that 80% of childcare staff in the private and voluntary sector are paid less than Scottish Living Wage. National Workforce Framework. The Christie Commission highlighted the necessity for a joined up vision for the public sector workforce. A National Workforce Framework could prevent wasted effort reinventing the wheel on issues like staff transfer, pensions, secondment and common procedures. This could include a staff governance framework, similar to that adopted by NHS Scotland, and a common approach to training and development . This three stage approach means government should take a robust stance on poor practice and set out what good practice looks like with sufficient practical guidance. Then adopt a series of practical steps to ensure Fair Work is delivered using the levers available to the public sector. Ambition is good, but it must be followed by practical action to deliver Fair Work.